Natural Sports Medicine Blog: Ankle Sprains... What Do You Do? So, you step wrong while running and you hear that crack from your ankle. From my past blogs, you know the first thing you do is to apply ice compresses. Hopefully you make your way to a good sports chiropractor (hint-hint) or athletic trainer for a proper exam and good care. But, you're likely to go to the local drugstore and buy an Ace-bandage or a neoprene ankle support or somthing else similar. I've always liked a good elaborate tape job with lateral & medial ankle stays (stirrups), double heel locks and the classic figure eight around the ankle. Of course that was a pain to have to have done every day, especially to try doing it to yourself. I went from classic white to self-grip tape, but the effectiveness of the tape wears off after maybe an hour, if that. Ace-type elastic bandages will give you some support, not much and similarly those neoprene sleeve give you a little support as well. Nothing really great. 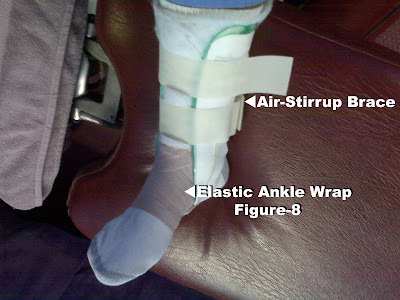 When used properlt, the air-ankle stirrup is probably the best. Used properly means wearing it with a properly laced up sneaker or shoe. As I've said previously, I like to use it in hi-top basketball sneakers. frequency of reinjury, ankle motion, and function. alone, an elastic wrap alone, or a walking cast for 10 days. Today is day 5 of my ankle sprain ordeal. I guess you can call this the the Ankle Sprain Chronicles..... The things I'm telling you in this and the 2 prior blog posts are the things I do for myself(and other sports chiropractors do...). My ankle is a Grade II+ sprain possibly a grade 3. It is quite unstable, very painful if not kept in a neutral position. 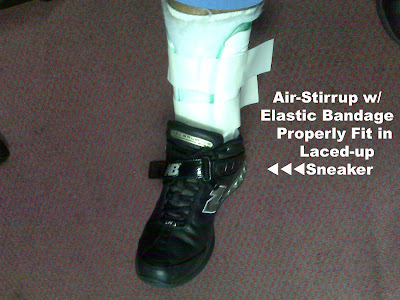 But, with the 3" elastic bandage around the ankle and the air-stirrup and my hi-top sneakers(Love thos New Balance B-Sall Sneakers), I'm able to walk around my office and treat patients. Yesterday, I even went to the gym and worked out with my trainer....non-weight bearing of course. As soon as I'm ready I will be posting short videos to show you the types of rehab I'll be doing...look for that in future blog posts.